A series of collisions on westbound Highway 401 has closed the roadway at Orford Road, involving three tractor trailers and one motor vehicle. Westbound lanes of Highway 401 are closed at Orford Road near Ridgetown after a fiery multi-vehicle collision involving three tractor trailers and another vehicle at around 3 p.m.
OPP say traffic was stopped while entering a construction zone. One tractor trailer "failed to stop and collided into the rear of a stopped tractor trailer." That caused the stopped transport truck to collide with a third tractor trailer. The third big rig collided with the rear of a car. 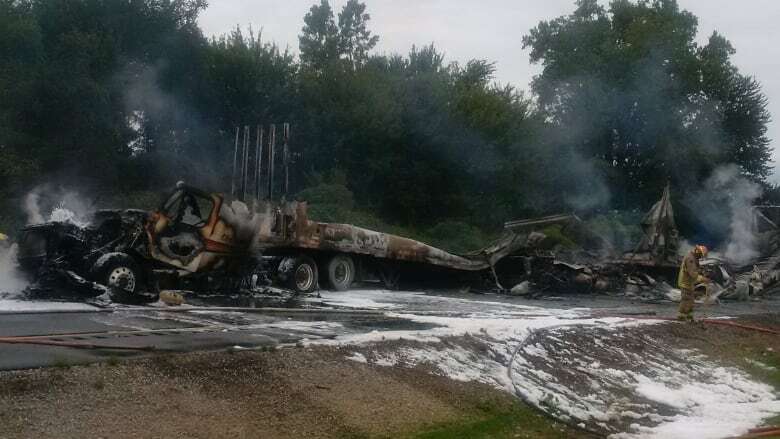 "As a result of the collision, the first and second tractor trailers caught on fire and suffered extensive damage," OPP say. One of the drivers of the tractor trailers suffered minor injuries and was taken to hospital, according to OPP's news release. OPP originally expected the road closure to last approximately four hours to allow for clean up of the scene. As of 7:20 p.m., police are unsure of the reopening time.